Beers And Cameras LA — B&C LLC. Our next Beers & Cameras LA is on Saturday April 20, at 5 PM at Brouwerij West in San Pedro. The venue is child and dog friendly, they have on-site food trucks, and is open until 10PM. It has a large space so bring your friends! We also have a possible photowalk in the works, stay tuned for more info! Come out to Beers & Cameras LA is on Saturday May 4, at 3 PM at LA Biergarten in Downtown Los Angeles. We will definitely be shooting around Downtown the first couple of hours, stay tuned for more details! We have another photowalk and meetup on Saturday May 18! 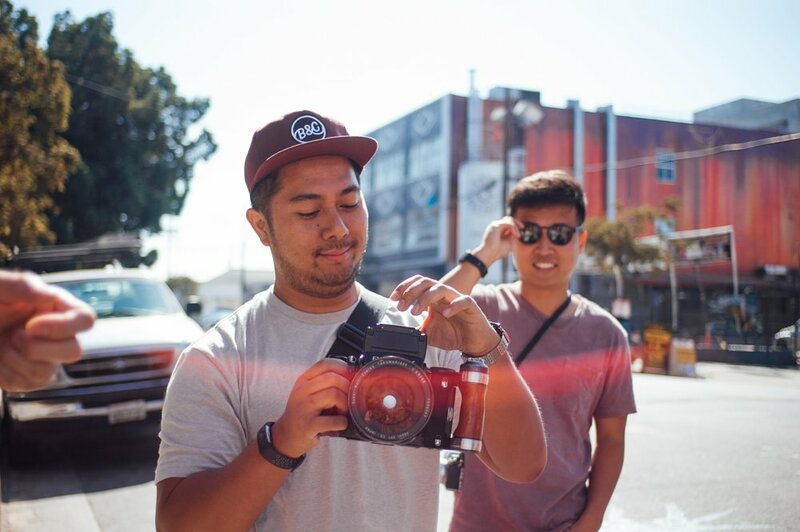 The photowalk will start at 3 PM at La Columbe Coffee, walk along the LA River, and end up at Frogtown Brewery around 5PM! Beers and Cameras LA: MacLeod Ale Co.
Come meet us this Saturday April 6, at 5 PM at MacLeod Ale Brewing Co. in Van Nuys for our first Beers & Cameras LA of Spring! The venue is child and dog friendly, they have on-site food trucks, and is open until midnight. Come meet us this Sunday, Mar. 17, at 3 PM for a photo walk starting at Stumptown Coffee Roasters and ending at Indie Brewing Company where we’ll have our regular B&C LA meetup at 5 PM. See you all there! Come meet us this Wednesday, Feb. 27, at 6 PM for a beer release celebration! We’ve been invited by CineStill and Idle Hour, who will be hosting the launch of a new beer released by friends of friends Fremont Brewing. The new beer, Sky Kraken (! sweet branding, right? ), is a delicious hazy pale ale. First 24 through the door get a Sky Kraken branded glass! Later this weekend, grab tickets and meet us in San Clemente at Film Photography Paideia — a film photography educational extravaganza! Welcome to 2019!!! For our first meet-up of the year, we wanted to start at a place I’ve been wanting to try for a long time, The Stalking Horse. They brew their own beers, but there’s more than just beer at this spot. Come meet us this Saturday, Jan 19, at 6 PM for drinks, awesome food, and hopefully an awesome camera gear shot. We’ll soon have the schedule for the next few months posted. Stay tuned, and meet us this Saturday to give some input if you have some cool spots you’d like to see added to the list! Okay, everyone! So here’s the deal: it’s just been way too nice not to meet, even if it is close to Christmas. So we’re doing a west-side, beachy, late-afternoon-to-sunset photo walk and subsequent meetup at a fairly new spot we haven’t hit up yet: The Dude’s Brewing Company. Meet us first this Saturday the 22nd at Bluestone Lane in Santa Monica at 2:30 PM for coffee (park for free in the neighborhood a block away). Then, walk around with us through Third Street Promenade, Ocean Ave., the beach, and the Santa Monica Pier if we have time before heading to The Dude’s Brewing Company’s Santa Monica location around 5-5:30 PM for what we do best: taking photos of beer (*cough* *cough*). The 8 PM ending is a soft ending. Stay as long as you want! No one is closing until quite a bit later. Brings some film or some cleared off memory cards and shoot something awesome before your family photo extravaganzas steal your camera’s attention away. See you there. Not to be confused with LA Biergarten (which will come later), this is Biergarten LA. Photo walk 4-6 PM (reach out to Paige or Chris for more info). Call or text Adam at (408) 219-9184 with questions or issues. 1) Biergarten LA, Los Angeles: 6 p.m. — 9 p.m. Photo walk 4-6 PM (reach out to Paige or Chris for more info). 1) Father's Office, Helms Ave.: 6 p.m. — 9 p.m.
1) Eagle Rock Brewery, Glassell Park: 6 p.m. — 9 p.m.